Textured metal handles, resembling bound strips of leather, are a notable feature of the hefty Soho Galena Large Round Cutting Board from the CUTTING BOARD Collection. Sandcast of decorative metal, the silver handles offer a dramatic contrast to the richly colored wood of this substantial cutting board. 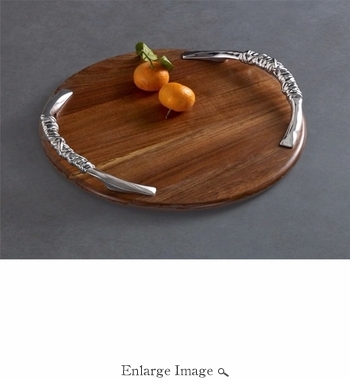 Ideal for serving your favorite cheeses or charcuterie. Makes a welcomed gift.